Adventures of Mini-Goddess is a Japanese adventure animated TV series for children showcasing the many adventures of Marla and her mini-goddess friends as they embark on different quests every episode and try to win at their set mission unscathed. Themes include friendship, joy, learning while playing and the importance of growing up together with friends. Whenever Keiichi leaves the house, Belldandy, Urd and Skuld shrink themselves to play with the other residents of the area - including their clueless cat sidekick Gan. Whether it's a guest to starta rock band or adventures in baby-sitting goddess adventures are dangerously funny! Belldandy: Even though she remains the most powerful goddess, Belidandy has the smallest part in this show because Urd, Skuld and Gan usually cause all of the trouble. Everyone always relies upon Belldandy for rescues, compassion, and a fine tea service - Belldandy truly represents everything good in the world. 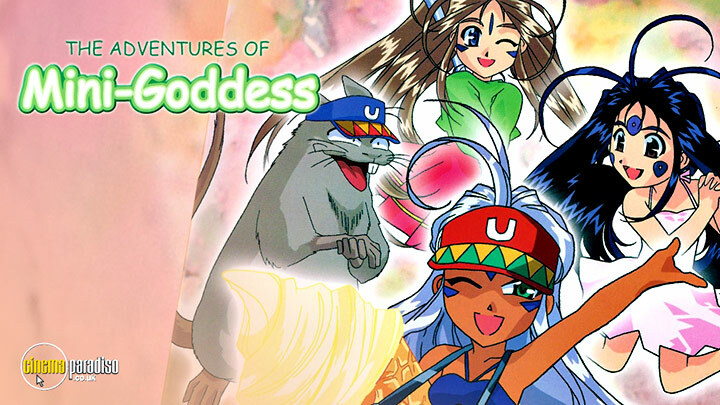 Twelve more episodes of the Japanese anime series following the adventures of the Goddess team,Belldandy,Urd,Skuld,and their friend Gan the Rat,who have managed to shrink themselves in a freak accident. In this volume,the team come up against a new villain,the voluptuous Marla,a sorceress demon determined to destroy them. Episodes are: 'Chu Hard - Gan-Chan's Desperate Situation'; 'Chu Hard 2 - Descent of the Devil'; 'Pop! Goes the Urd'; 'Rainy Day'; 'Let's Meet in Our Dreams'; 'Female Detective Skuld's First Case'; 'Goddess Love Theatre'; 'Quick Fix Division of the Tariki Hongan Temple'; 'Fishing Journal'; 'Give Me Some Servants'; 'Rules of the Ninja (1)' and 'Rules of the Ninja (2)'.